Mannington Township, Salem County, N.J. – Troopers and detectives from the Woodstown State Police Barracks are investigating a home invasion assault and are asking for the public’s help to identify a suspect based on a sketch. On Saturday, June 29, at approximately 10:30 p.m., the 24 year old female victim was in her residence when she heard her front door open slowly. When she checked to see who had opened the door, she observed a man standing in the foyer of her residence. According to the victim, the man approached her and threw her down onto a glass table that shattered. She was able to fight off the attack and the subject fled south on State Highway 45 towards Salem City. The suspect is described as a dark skin, black male in his mid to late 20’s, approximately 5’10” tall with a thin build. He has brown eyes with a wide flat nose. He was wearing a black tee shirt and baggy light blue jeans. He also has a small mark on the right side of his neck, possibly a birth mark or scar. 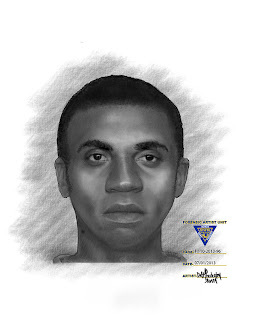 Anyone with information that would assist in the identification of this suspect is asked to contact the NJSP Woodstown Station detectives at (856) 769-0775. Callers may remain anonymous.